We learned how to pray by welcoming Jesus to our heart in #27 and #28 of Prayer with body. We talked to Jesus, imagining that Holy Communion stays in our heart. 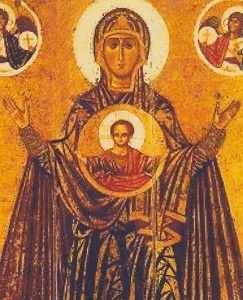 Now, we use the image of infant Jesus, who is in the Virgin Mary’s heart in the icon of Our Lady of the Sign. Christians who repeatedly receive Holy Communion cannot help but believe that Jesus stays in our heart. Let’s call Jesus so that we can be more united with Jesus. The following way would be appropriate to call Jesus. We start with a familiar method which we can repeat for a long time. We start with the image of infant Jesus. As Jesus stays in our heart, we can receive more blessing from Jesus whenever we pray. This is represented by the image of Jesus who gets older.